Parents will wonder how they ever managed without the GoGo BabyZ Kidz Travelmate, just as everyone in the world can't imagine travel without roller suitcases. The patent-pending design of the GoGo BabyZ Travel Mate significantly lightens the load of parents on the go with toddlers and all their gear. Now with quick release wheels. 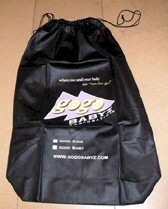 Go-Go Babyz makes traveling with toddlers a breeze with the gogo Kidz Travelmate. The gogo Kidz Travelmate is a convenient and safe attachment for a variety of convertible/toddler car seats. 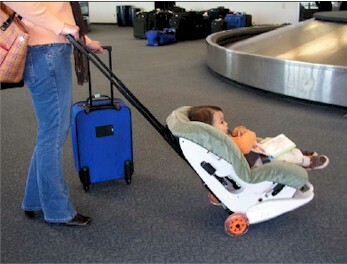 Instead of carrying your car seat and child through an airport, they can now be wheeled through a crowd! The GoGo Kidz is easily mounted and it allows one hand to be free. This stroller attachment features 5 inch razor wheels, a telescopic handle, and weighs just five pounds. Limited Time Special! FREE Travel Bag with Purchase! For babies and children up to 50 lbs. "Infants and children deserve the same protection that is provided to other airline passengers", says NTSB Acting Chairman Mark Rosenker. The FAA recommends it, but won't make the use of car seats mandatory. Bringing a car seat makes it better for the child, but it can be a problem for the parent. The patent pending gogo Kidz Travelmate can eliminate the hardship of carrying a car seat and corralling a child onto the airplane. The gogo Kidz Travelmate helps by converting the car seat into a two wheeled stroller allowing the parent to wheel both the car seat and the child together through the airport and right onto the plane. Handle Height Position One: 28"
Handle Height Position Two: 43.5"
Handle Height Position Three: 47"
Handle Height Position Four: 50.5"
The GoGo Kidz Travelmate Accomodates the following convertible and toddler seats. Below is a list of verified car seat manufacturers and models that easily mate with the GoGo BabyZ Kidz Travelmate. (Note: if you don't see your car seat listed below, Gogo BabyZ has not yet had the opportunity to test it ... yet -- please check back often as the following list will be updated as other manufacturer's car seats are verified). The Alpha Oemga 3-in-1 car seat has a removable base for certain situations such as airline use. The gogo Kidz Travelmate only fits with the base removed and the Thumbscrews positioned in the second hole from the top. See the Cosco owners manual to remove base and/or call us for instructions. 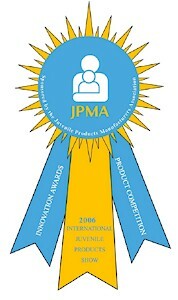 The gogo Kidz Travelmate was awarded the prestigious 2006 JPMA Innovation Award. The gogo Kidz Travelmate is a proud winner of the iParenting Media Award for Greatest Products of 2006. 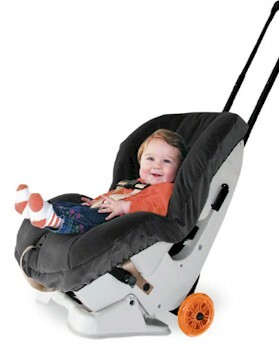 The gogo Kidz Travelmate won Best Product of the Year 2006 from Fit Pregnancy. The gogo Kidz Travelmate was also presented with the Preemie Cool Stuff Award. 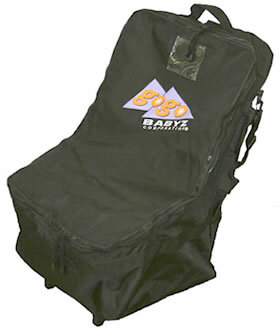 The Go-Go Babyz® Car Seat Protector Bag was designed to protect your car seat and seat cushion. And, as an added bonus, if you have a gogo Kidz® Travelmate, you can leave it attached to the seat and wheel your car seat, in the bag, to check in. A perfect solution for parents of older children who do not want a car seat on the plane but still need a car seat at their final destination. 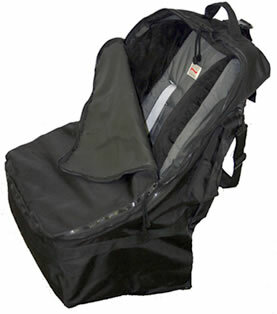 The Car Seat Protector Bag is a convenient and safe solution for a variety of convertible/toddler car seats! Fits most covertible and toddler car seat brands: Britax, Graco, Cosco, Eddie Bauer, Recaro and more.